iMeet® Central has version control. The system automatically keeps track of versions whenever changes are made to a file in the Files & Discussions area (excluding discussions). The Version History is located within the More tab. When more than one version of a file is created, the Version History tab will track versions, when each version was modified and who made the changes. Each previous version in the history has a link to Save as Current Version, which allows you to easily roll back to a previous version of a file. Note: Workspace Admins are the only users able to delete a specific version of a file. Versions are created every time a document is uploaded on top of an existing file. 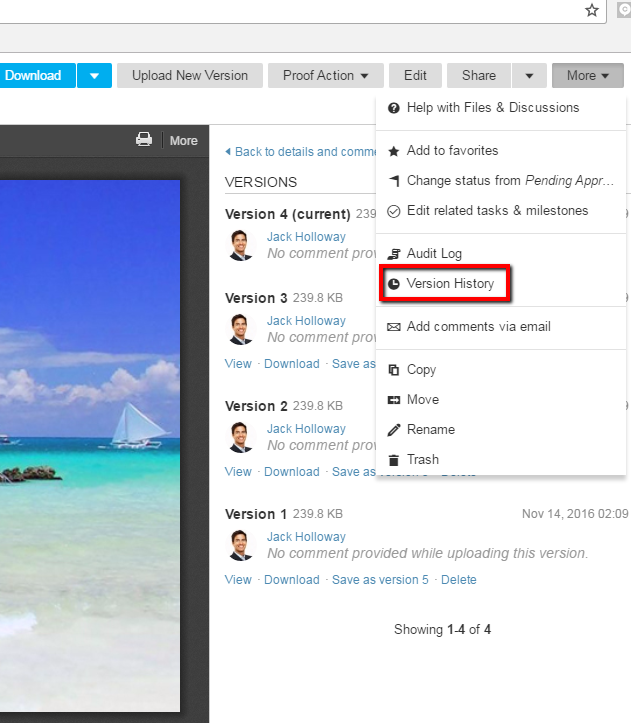 Files can be uploaded to workspaces using different methods, such as drag and drop or single file upload. You can also use the Locking and Unlocking feature to make sure your changes are tracked. You can also go directly to a file and select "Upload new version". Two versions of the same Online Document or Wiki page can be compared either side by side or in a merged view comparison. This can be useful when deciphering changes to a document. To compare versions of a document, click the right radio button for one document and the left radio button for another and then click Compare. Note: This feature is exclusive to Online Documents and Wiki pages only.